Around 120 camping champions hope to take their pursuit to the next level by entering a Press and Journal competition to win a brand new minibus. 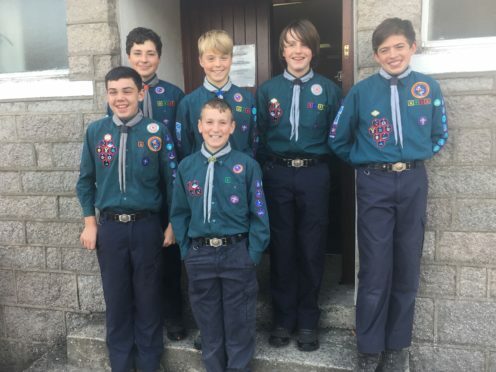 The 9th Aberdeen Scout group offers a wide variety of activities and adventures for scores of youngsters between the ages of six and 14. The Beavers, Cubs and Scouts all attend weekly meetings at their hut on Granville Lane and, if they’re not there, they can usually be found exploring the Scottish wilderness with their tents, skis or hiking boots. And they are so enthusiastic for outdoor adventuring they have been crowned the winners of the Scottish National Camping Competition for the last two years running. Friends and family of everyone involved are now collecting the tokens printed in The P&J with the hope of landing a stunning £40,000 minibus. At the end of the competition, sponsored by CNOOC International, one lucky team will be given a 17-seater Ford by AM Philip. Group scout leader Neil Lawrie said winning the bus will let them replace their current “long in the tooth” transport and help the youngsters reach their full potential. He said: “We have a history of always having our own transport – it gives us the flexibility and freedom to carry out many more activities and be a bit more ambitious with where we can go. “And while we can rope in a few parents to help take our Scouts somewhere, this would let us all leave together as a group without splitting people up, so we keep that camaraderie. Mr Lawrie added: “Our headquarters – which are also used by the Mannofield Explorers – were built in 1936 and it needs a new roof which will be quite expensive and, like everyone, we’re finding our resources tight. Tokens will be in the P&J until February 3, and the closing date for entries is February 11.